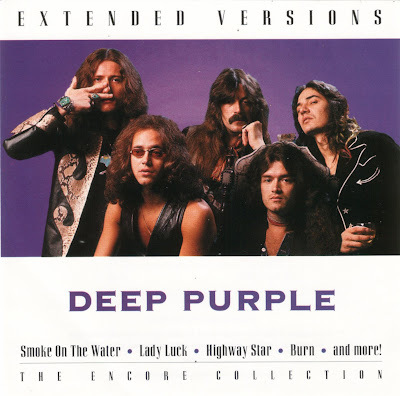 The BMG Special Products release of Deep Purple's Extended Versions is an edited version of material culled from the group's 1976 King Biscuit Flower Hour performance. The ten song CD captures the Mark IV Purple line-up of Tommy Bolin, David Coverdale, Glen Hughes, Jon Lord and Ian Paice, live on February 27, 1976, in Long Beach, California, and in Springfield, Mass., on January 26, 1976. The original King Biscuit Flower Hour broadcast is noteworthy as it is the only authorized concert release featuring the Mark IV D.P. lineup. The recording is taken from tour dates in support of Purple's Come Taste The Band album. American born guitarist, Tommy Bolin, doesn't attempt to fill the void left by moody axe slinger Ritchie Blackmore. Bolin, who weaved his solo career around his commitment with Deep Purple, worked his own fretboard magic on the older Purple songs. Bolin's strength was his ability to branch out in a variety of musical styles, as evident on such legendary Deep Purple cuts as "Highway Star" and "Smoke On The Water". Out front, David Coverdale's inspired singing sparks the group, while bassist Glen Hughes adds strong backing vocals. The ever steady Jon Lord isn't limited to adding keyboard fills, as his work adds another dimension to the Purple sound. Opening with a smoking version of "Burn", followed by a short take on "Lady Luck", Purple proudly storm from the stage. Bolin's "This Time Around" adds depth to the setlist, while the band breaks into covers of "I'm Going Down" and "Georgia On My Mind". The disc closes with a five-minute plus swing on "Love Child".